High demand in North America and Asia helped increase the goods traded among the countries of the world by a whopping 14% in the first nine months of 2000. That should produce at least 10% growth over the whole years, which is double last year's 5% overall growth in the value of merchandise traded (bought and sold) last year. The report shows that Western Europe and Latin America are picking up speed and joining the U.S. and Asia as major engines of economic growth. So, while the U.S. is still a locomotive force, it's no longer alone. Western Europe, however, is being affected by the strength of the dollar against the euro. In dollar terms, the region's exports grew by 3.5% but in euros they grew by 18%. Imports were up 6% in dollars, but 21% in euros. Detailed figures for last year showed that international trade in goods was worth $5.47 trillion. More than half of all expansion in 1999 was due to the increase in imports and exports in the United States... imports accounted for 18.5% of the world total, a "historically unprecedented level." Editor's Note: Approximately 15% of the $5.47 trillion in international trade is done on a non-cash, or countertrade basis. Upside magazine claims that advertising agencies must share the blame for the outbreak of dot.com malaria, because of the obscene amount of money which was wastefully spent on TV awareness for very little effect...instead of devising ad and marketing programs that would have direct impact on generating needed sales. The basic question is: Did the agencies really do their best, or just show up and collect the money? Upside contends that too many of the agencies took the easiest and most profitable way out, and that's where the problem lies. To place $10 million worth of ads on TV, versus print, takes about 50% to 66% less personnel cost. TV chews up million-dollar chunks pretty quickly, but the low costs of personnel for TV advertising are often compelling to agency management. People-costs drive agencies; 50% savings are huge. The second issue is production costs. Agencies make money producing TV spots. There's a flat fee on production, plus any hidden profits they make on the actual shoot. Third, agencies get their big visibility from TV commercials, not from direct-mail campaigns. Inasmuch as advertising's most basic goal is to increase sales, according to Ziff-Davis analyst and VP Aaron Goldberg, the dot.coms should start demanding some accountability. The dot.com e-tailers have made adjustment for this year's holidays by dropping their canned, expensive television advertising campaigns from last year. Instead they're grabbing consumer's attention by sending out a flood of catalogs across the country. And about half of their catalogs even let consumers bypass the web altogether with a 1-800 number for orders! This is the third e-Christmas...with companies and conditions continuing to evolve. The message now, according to more and more people who follow the dot.com e-tailers evolution, is that most web retailers cannot survive in cyberspace alone. Too much barter revenue creates a buying opportunity. That's the message from Lazard Freres regarding CNET Networks, when their stock dropped 25% in a single day after a market over-reaction to the online media company's disclosure that barter revenue, and revenue in the form of securities, made up about 12% ($5.8 million) of their total third-quarter revenue. Going forward, CNET expects its barter revenue to remain in the 5 to 7 percent range. Retail trading was fast and furious in Southern California's Orange County on Sunday, December 3rd. The BXI Exchange held the nation's largest Trade Fair with 199 booths. Staged by Orange County Area Director Ilan Ben-Yosef, this year's event was the largest ever for the annual event, and had several other area directors participating from California as well as Nevada and Arizona. Simultaneously, 35 miles to the north in Buena Park, TradeAmericanCard (one of the BarterNet affiliates) also staged its annual trade fair. A wide array of goods & services were available; the heavy morning traffic saw several vendors selling out their merchandise by noon. The more successful vendors at these two events will sell $15,000 to $30,000 worth of merchandise in a 5-hour period of time...while paying but $250-$500 for booth space. The Internet Barter Auction is re-opening as: http://www.barterXpress .com. Official opening for bidding is Wednesday December 6, at 12 noon (EST). The first 100 auction lots listed are commission free, if posted before the grand opening. Active International Founders, Alan Elkin and Arthur Wagner, were named "Businessmen of the Year" and honored by the Meals on Wheels Program. Meals on Wheels provides home-delivered meal service to Rockland County (New York) residents who are shut-in due to illness, advancing age, or physical handicap. 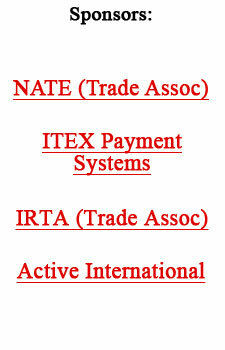 Active International is the world's largest corporate trading company. In our November 28 issue we reported on how "Quid pro quo," a form of barter, is being used in venture investing...another slant on this technique is being practiced by the pharmaceutical giant Merck & Co.
Not only will Merck Capital Ventures, their new e-health venture fund, invest in information-technology companies, they'll also offer (these companies) the opportunity to do business with Merck or their extremely successful website Merck-Medco...one of the top 20 retailing sites on the Internet. Shanghai-based China Bartering Co. Ltd., www.chinabartering.com, was formed in 1988 as a joint venture between provincial governments. It works to bring together manufacturers and raw material suppliers. The company has been preparing to go public for more than a year on Shenzhen's second board, or Hong Kong's Growth Enterprise Market. Their start-up capital was about 30 million yuan ($3.6 million).